Now with famed Bollywood producer/director Karan Johar releasing the first-look poster of his studio's new movie The Ghazi Attack, we thought it might be a good time to brush up some history. While Indian Navy claims the submarine was destroyed by depth charges fired by INS Rajput, Pakistani authorities say the submarine sank because of either an internal explosion or accidental blast of mines that the submarine itself was laying around Vizag harbour. In 1971, Indian Navy's Eastern Naval Command under the leadership of INS Vikrant (in pic), had effectively created a Naval blockade which completely isolated East-Pakistan in Bay of Bengal. Frustrated with the Naval Blockade, Pakistan decided to send the best submarine in its inventory - PNS Ghazi. PNS Ghazi was assigned with a two-fold objective. The primary goal was to find and sink INS Vikrant and the second one was to lay mines on India's Eastern seaboard with or without accomplishing the primary objective. PNS Ghazi, formerly USS Diablo, was a WWII submarine of the US Navy commissioned on 31 March 1945. Falling behind technology curve, USS Diablo was loaned to Pakistan on a four-year contract with a renewal option or purchase afterwards. In 1964, USS Diablo was formerly inducted into Pakistan Navy and was rechristened as PNS Ghazi to become Pakistan's first-ever submarine. During the 1965 Indo-Pak war, PNS Ghazi was assigned to keep a watch out for its main threat, INS Vikrant. After the war, PNS Ghazi was recalled to Karachi and later went to Turkey for repairs and upgrade its inventory. Without PNS Ghazi, Pakistan navy could not interfere with Vikrant's operations in East Pakistan. It was extremely risky of sending an ageing submarine completely around the subcontinent to attack the enemy's flagship in it's home waters. Besides, Ghazi was by then experiencing regular equipment failures and maintenance facilities at Chittagong were poor. Overruling these objections, PNS Ghazi quietly sailed out of the Karachi Harbour on November 14, 1971. The deployment of the Ghazi to the Bay of Bengal was revealed to the Indian Navy when a signal addressed to the naval authorities in Chittagong in East Pakistan was intercepted requesting information on a special grade of lubrication oil that was used only by submarines and minesweepers. 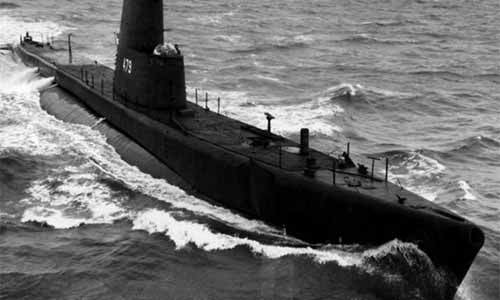 As minesweepers and the Daphne class submarines did not have the range to operate in the Bay of Bengal, it was assumed that submarine Ghazi was stalking INS Vikrant. At that time, Vice Admiral N.Krishnan was the Flag officer Commander-in-Chief of the Indian Navy's eastern Naval Command. He decided to counter this contingency with as many deceptive measures as possible. Under Krishnan's order, INS Vikrant and her escorts left to a secret location known as 'Port X-Ray' near Andaman Islands, on November 13. Even the crew was not informed of their destination. Having sailed the fleet away to safety, Krishnan roped in INS Rajput, an ageing WWII destroyer that was actually sent to Vishakapatnam for decommissioning. INS Rajput was to pretend to be INS Vikrant, sail out of the Vizag port and generate heavy wireless traffic. The Indian Navy intentionally breached security by making an unclassified signal in the form of a private Telegram allegedly from one of Vikrant's sailor's asking about the welfare of his mother who was "seriously ill". Ghazi started looking for Vikrant on November 23 off Madras but was not aware that she was 10 days too late and the Vikrant was actually somewhere near the Andaman islands. Vice Admiral Krishnan sent for Lt.Inder Singh, the Commanding officer of the Rajput for detailed briefing and told him that a Pakistani submarine had been sighted off Ceylon and was absolutely certain that the submarine would be somewhere around Madras/Vishakaptanm. He made it clear that once Rajput had completed refueling, she must leave the harbor with all navigational aids switched off. INS Rajput sailed out on 2 December and returned to Vishakapatnam on 3 December and again sailed out with a pilot on board, just before the midnight of 3/4 December and on clearing the harbor, proceeded along the narrow entrance channel. When the ship was halfway in the channel, it suddenly occurred to the Captain that "What if the Pakistani submarine was waiting outside the harbor and torpedoes us as we disembark the pilot who was on board, at the Outer Channel Buoy?" He immediately ordered to stop engines and disembarked the pilot. Meanwhile, Ghazi being unable to locate INS Vikrant around Vishakapatnam resumed laying mines on the night of 3rd December when Pakistan signalled the commencement of hostilities. Ghazi came up to periscope depth to establish her naviagtional position which was made very difficult due to the blackout and switching off of all navigational aids. Rajput slowly increased speed to maximum by the time it reached the Outer channel buoy. At this point of time, Ghazi saw or heard a destroyer approaching her at high speed at an almost reciprocal course and went into a steep dive and at the same time put her rudder hard over in order to get away seaward. The Captain of Destroyer Rajput noticed the disturbance of water caused by the hasty dive and launched two depth charges at that position. The charges struck the submarine that was already in a steep dive causing Ghazi to hit seabed hard when it bottomed. The fire spread to where the Mines and torpedoes were stored and these blew the forward hull outward. It is also possible that the detonation of the charges triggered a mine that was being kept in a ready state near the torpedo tube. This was Indian Navy's version. As the lights ashore were blacked out, PNS Ghazi may have misjudged her position and doubled back into her own minefield around midnight; about 10-15 minutes before the INS Rajput depth charging. Thus, it was the accidental detonation of its own mines that destroyed the Ghazi and not INS Rajput's depth charges. Many theories came forward since and it transpired that naval authorities also destroyed records of the sinking of Ghazi. Whatever caused the Ghazi to explode, it was nevertheless, the Indian Navy's ingenuity and deceptive planning that caused the submarine to a follow a preset path which ended in a watery grave for its sailors on board.